At the age of 62 and living with MS, Judi Hall decided she wanted to seize every opportunity for adventure. Here she tells us all about her skydive, which she did to raise funds for the MS Trust. My skydive was fabulous and I loved every second, in fact I wish it had taken longer. Seeing the world from up there makes you feel mighty small really. You get a different perspective on things when you see, quite literally, life below your feet. I got very excited on the day and was in danger of wishing it away. As luck would have it, the early jumps were delayed a little because of low cloud. That gave me time to savour the atmosphere at Dunkeswell Aerodrome, which is a lovely place with many relics of WWII. Seeing the whole layout of the original airfield from 15,000ft brought home the fact that it had, indeed seen action in the war. I have Secondary Progressive MS, it is a damned nuisance but my diagnosis in 2000 cleared up so many questions. I had been told for years that I was a hypochondriac, but that never explained why one day I could run upstairs and the next barely get up the first two. I was 47 and had been experiencing symptoms since shortly after my son was born in 1973. You can imagine how at times, I thought I was going mad. It caused a huge rift in my marriage and I was divorced in 1993 after 23 years. I believe everything happens for a reason though and I met my current husband in 1998. He proposed in 2000, after my diagnosis, and we married in 2002 (when I was 50 years old) and he is very supportive. I was 62 when I did my skydive, which proves it's never too late. I now have a new mantra: adventure before dementia! I am a Sea Scout Leader so am pretty busy with adventures. I recently went to Jersey with the troop and led the cooking team, serving meals for 38 for 9 days. Compared to that skydiving is, pardon the pun, a piece of cake. 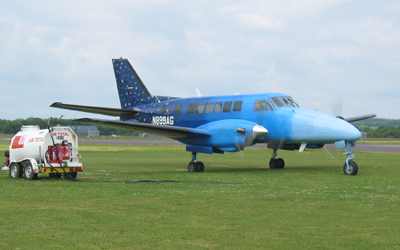 Here is a photo of the brilliant plane that got me to 15,000ft in just nine minutes... AWESOME. Kneeling at that doorway and seeing the world has been, so far, the most amazing experience. I hope to do it again in the not too distant future. Would you like to experience your own skydiving adventure? Make this the year you tick a parachute jump off your bucket list! By getting involved with our Jump in June campaign you can take part in a tandem skydive at one of 20 participating airfields across Great Britain on a day that suits you during June. No experience is required as all training is given and if you raise at least £395 in sponsorship for the MS Trust, this will cover the costs of the skydive too. Your jump and training will be completed in one day and you will be harnessed to an instructor who will control the parachute for you.